Another weekend has passed. Why do they go by so quickly? We had a pretty good weekend. Sutton does have a cold (who gets a cold during the summer? ), but we made the most of our weekend which included the beach, the playground, going out to dinner, some pool time and a whole lot of sunshine. We are having the hottest summer. Hotter than many years past. It seems like we had a intense winter and now an intense summer. But I will take a beach day over a snow day any day. Friday we worked all day, so we didn't get to do our usual errands after work. We picked the girls up from my parents house, chatted for a bit and then headed to Trader Joes. The girls get so excited when we pull into the TJ parking lot. They know where we are going. We got the essentials for our beach day and then headed home. Once we were home, I made the girls dinner, we played and relaxed most of the evening. I made Rory and I a quick dinner of pot stickers and wine since I had sushi with my co-workers for lunch and I was still full at dinner time. We watched a couple shows and called it a night. Saturday morning we were up bright and early to get ready to go to the beach. We ate our breakfast at home, loaded up and made the hour drive to the beach. We got settled in and stayed for about 5 hours and it was glorious. I never get tried of Tahoe. NEVER. We STILL have snow in the mountains in JULY! We left around 2 pm and the girls were asleep before we left the parking lot. Once we got home, we gave the girls a bath and then showered ourselves. We played and did some things around the house until we took the girls to a new restaurant in town and it was really good. The girls loved everything. And I can just talk about my girls' eating habits for a minute? They won't eat fruit, but they will eat Thai food, spicy food, veggies, meats and almost anything you put in front of them....except fruit. Blows me away. After dinner we headed home and relaxed until it was the girls' bedtime. Then Rory took Walter for a walk while I cleaned up around the house and did a load of beach laundry. Sunday we had a relaxing day as I had the worst migraine. I am not sure if I didn't drink enough water at the lake or what, but I had a monster headache. Rory headed out to get some coffee and donuts which we all happily enjoyed. I did manage to clean the house while Rory and the girls did some yard work in the backyard. After being cooped up for the morning, we took the girls to the mall so they could play in the indoor playground and burn some energy off. I stopped in Bath and Body Works for a lotion and ended up buying the two get one free and then I saw my favorite Champagne Toast on clearance. What? I thought they only had it during the winter months? Nope. 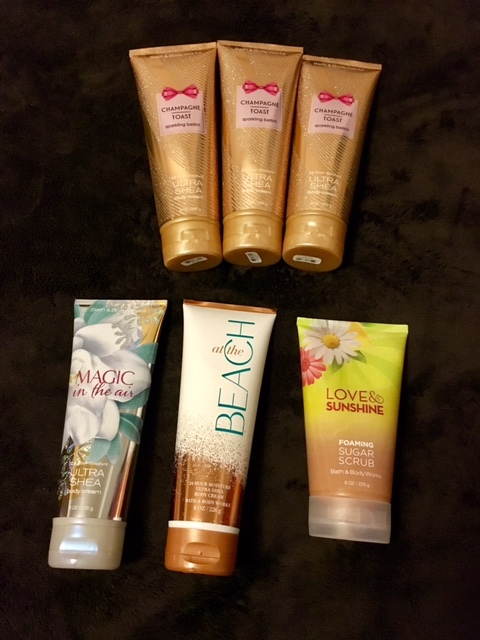 They had three bottles of the lotion and a few bottles of the body wash, so I scooped up the lotion at over half off. We grabbed a quick bite to eat before heading home so the girls could take naps. Late naps, but they slept over 2 1/2 hours. While the girls napped, I took a little nap and then went grocery shopping. When I came back they were still asleep. Rory got their little pool ready for when they woke up. The girls played in the pool while I cooked dinner (homemade spaghetti which simmers for a couple hours). The girls had my spaghetti and bread and they LOVED it. They were completely dirty after, but loved it sooooo much. While I cleaned up, Rory bathed the girls and then we cuddled until 8 pm when we put them down for the night. Sutton's cough was keeping her up, so she was still awake when I got back from walking Walter. It took her nearly an hour to get to bed. Then she woke up around 1 am from coughing and Rory had to sleep in their room. I had to deal with Walter who decided to run laps in our backyard after an animal I am assuming. I only heard the noises. I didn't see the actual animal to tell what it was. Then some idiots decided to set off fireworks once he was settled down and then he cried for awhile and kept me up. So we are exhausted today. Phew. But we are at the start of a new week! Lake Tahoe looks amazing!! I need to make a trip! My husband loves it out there! Oh my, Tahoe looks like what dreams are made of!!! The clear water and snow covered mountains are stunning! Too funny that the girls will eat all those things you mentioned, but not fruit? What???? Sounds like you guys had a great weekend! Tahoe looks a amazing! So sorry about the Fireworks, I hope your Monday goes smoothly! Magic in the Air was my fav this year, would love to try the Champagne Toast! Have a great start to your week beautiful! Girl, Tahoe is GORGEOUS! I'll have to add it to my bucket list of places to visit! Glad you guys had a great time! Tahoe is so beautiful!!! What a great time. Your beach day looks fun! I hope Sutton feels better soon. My goodness that beach view is gorgeous!!! Glad you had a lovely weekend! I seriously can't get over how clear that water is! I would love clear water like that because not only is it beautiful, but you can see what's below, ha. Sounds like you made lots of yummy meals. How do you make the pot stickers? I'd love to know that one! I'm so jealous of that beach!! It looks GORGEOUS!! How fun to stay there all day! I can't believe what your girls eat, mine won't touch anything hahahhaa. ok Tahoe looks amazing. that lake is gorgeous!!! I would live in that water if I could haha. So glad you had a great weekend!! Okay, those beach and water views?! Divine. I've never been to Tahoe, but it's totally on my bucket list - even more so after these pictures. Sounds like you had a lovely weekend! Tahoe looks so beautiful! I need to visit. Ugh fireworks have certain days neighbor! Hope you are better rested today! Looks like a wonderful time.. we still haven't made it out to the beach this summer.. I am so jealous of your awesome weekend! Tahoe is so beautiful!